By now you may well have heard of Google+, and you think it is a ‘social media thing’, right? Well, there is a lot more to it for businesses than that aspect. b) To build relationships and develop loyal ‘fans’ of them and their brands. And you’ve heard all that nonsense about Google+ being a ghost town? Well, with over 150,000 communities with more than 10 people, and tens of thousands will thousands of members, Google+ is really happening. This is how you too can get started before you wake up in 2015 and your competitors have built relationships with your potential tribe. 1. Public: The content of which can be seen by everyone. You can either set these as ‘ask to join’ or keep the doors wide open. 2. Private: This content cannot be shared outside of that community and can only be viewed by members. The content can be found in Search, but it doesn’t have to be. Note: You cannot change from Private to Public, or vice versa, once created. Now, let’s look at what can be done for content seeding and increasing engagement. Here is a really big thing: Google indexes the community and its content when ‘public’. This means that people can find your community in Google Search, as well as within the search function of Google+ as well. If you build up your community and support the other members (especially by having conversations with them), then when you drop in your own content you will often find they will engage with you too. With each Google+ post having its own URL you can easily grab the link and share that with other people. This way you can take your content and point people toward it. A community attracts people. They want to belong. Sure, people may follow a Google+ page, but they cannot really be a part of those. If you want to build your brand then this can be a very powerful tool. Plus, you can ‘shut the doors’ on a public community in order to increase engagement even more. What I mean by this is that you can put up a velvet rope and ask people to ‘request to join’. If you do this, you will see a list of new requests. This is a great way to find the people who are most aligned with your brand values, and those who you most want to join. We’ve been using this in the Plus Your Business community and the engagement has gone up enormously. Google+ notifications stay switched on for people in a gated community. This means that every post you or anyone in your community makes will appear in your members’ notifications area. In a well-run community, this means that the most important content can break through and reach people through the noise. Community management is a must though as people will switch off notifications if there is poor quality content or spam. It’s worth knowing and understanding that this isn’t the case in very large communities (more from Google+ on all this here, with thanks to Alex Garcia for surfacing this information). This is a great feature for building a dedicated community and a strong mailing list. Before you even think about the world seeing your marketing content, Google+ communities can make it super easy to create content that rocks. Simply set up a private community, invite people individually, or invite a circle of people you want to include for that particular project. Then you can drop post ideas into the community for immediate feedback. If you want to take this idea up a level, then look at using a Google Hangout (up to 100 people in the chat aspect of it) and invite those people to throw ideas around ‘real time’. You can then start a video call to talk through who has the best ideas. Once you have completed a discussion about your post idea on a thread, you can archive it. Simple. 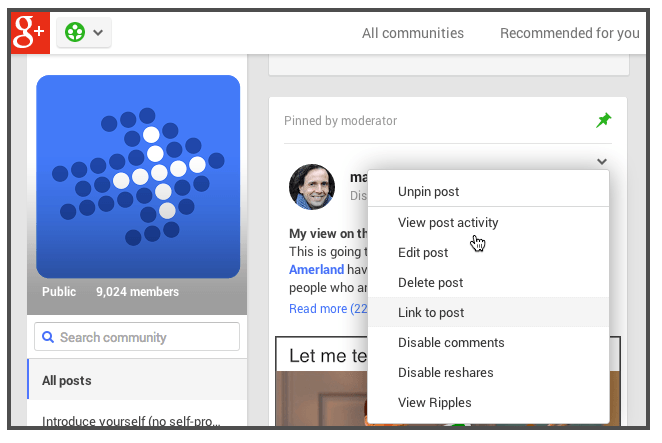 Google+ offers many options that allow you to be in control of your community. For example, once you have completed a conversation you can ‘disable comments’, which allows people to still see your conversation, but no longer contribute to it. This is an important feature – you are hosting the conversation and can decide if/when it is time to move on. Also, you can choose whether to allow reshares so that you can keep the conversation on a post and in the community, or allow the content to spread outwards when you are ready. You can also ‘pin a post’. This is not unique to Google+, but the design is very clean and it is a great way to grab attention. Google+ allows you to have insight into any (yes any) publicly shared content on Google+. As you analyze your content and its reach, you’ll be able to find influencers and interact with them, build the relationship, and even include them in your community. When you do this, they will likely start engaging with your content and spreading the word. Free communities means you can set up as many as you want, and have content creation teams working on as many projects as you can imagine. Imagine if people had so much passion for your products that you were to develop a tribe of people that were willing to help other people fall in love with your brand? I bet you are thinking this is far-fetched, hippy thinking from this Google+ loving Brit. But I mean it. It is already happening for hundreds of brands on Google+. There is something magical about the platform that enables people to come together around their passions. If you have a technical product that requires a good product understanding, why not empower the best users? When you put the power in the hands of your users, they will reward you for your trust by helping other people solve issues and make the most of your products and services. If you appropriately share your content into an existing community, you may well find it receives greater engagement, especially if you have targeted it well. This is a powerful tool for anyone who wants feedback and engagement, and even more of an important tactic if you haven’t already built up a strong network. Participating in existing communities allows you to publish your content into a hive of ready and willing community members. If you nurture the engagement you receive as well as asking for it, by add those people into circles, answering comments, and making the experience about them, you will have set yourself up well for future posts and campaigns. All of this engagement tends to be seen as the key to social search engine optimization. Be sure to check community guidelines when it comes to posting policies before you start publishing in existing communities. It’s a good idea to get to know the community owners and moderators a little before you start posting in the community. If you set out to form alliances with people like product user group evangelists (there are a LOT of them on Google+) you will be able to work on joint projects together, and even consider sponsorship for the communities or members. With appropriate disclosure of interests, you’ll be able to take your brand to a new community of interested audience members. This can raise brand awareness and enable you to build up your list of evangelists along the way. People are ready and waiting to fall in love with your brand. You just need to turn up your strategy and invest in communities.